Something really wild is happening over at BetVictor Casino. To celebrate the recent release of the jungle-tastic slot game, Jungle Spirit: Call of the Wild, the site is holding a huge £10,000 prize draw. By playing this new game at BetVictor, you could win up to £2,000 cash. So read on if you’re ready to take a trip deep into the tropics to get your hands on this gigantic prize pool. In most prize draws, only a small number of entrants are lucky enough to be picked at random and treated to a reward. That’s definitely not the case in BetVictor’s Jungle Spirit prize draw. Remember that as these prizes are paid out as real money, there are no wagering requirements to play through. The cash will be yours to withdraw as soon as you win. The Jungle Spirit promotion will run at BetVictor Casino between the 5th and the 11th of June. During this promotional period, every cumulative £10 you spend on Jungle Spirit: Call of the Wild at the site will earn you one prize draw entry. There’s no opting in required. All you have to do is start spinning the reels of the game and you’ll be in with a shot of winning one those incredible amounts of real money. The maximum number of entries you can earn is 50 per day. That’s plenty of chances to be picked in the random prize draw. Jungle Spirit: Call of the Wild is a truly groundbreaking game. Launched in March 2017 by NetEnt, the game takes players deep into a mystical rainforest to embark on an adventure alongside exotic wildlife. The reels are located in a steamy jungle, filled with lush, tropical greenery. The symbols on those reels are mainly made up of wild animals, such as tigers, cobras, elephants and crocodiles. These symbols are set out across five reels and three rows with 243 ways to win in the base games. However, during the bonus round, the layout of the slot completely changes and the number of ways to win increases to 1,024. There are a few bonus features to play for in Jungle Spirit: Call of the Wild. Perhaps the most exciting is the free spins round which is triggered when three or more pink flower scatter symbols show up on the reels. During the free spins round, your wins could be subject to a multiplier as high as 50X. 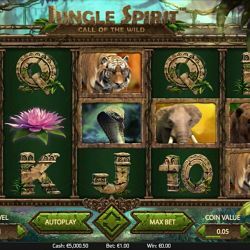 During this promotional period, all registered members of BetVictor will be entered into the prize draw every time they spend £10 on the Jungle Spirit: Call of the Wild slot. Only real money wagers contribute to prize draw entries. Bonus funds and free spins do not count. The random draw will be held on June 12th. Prizes are paid out as real money and are therefore free from any wagering requirements.